This year not only we placed the tree in a new spot, but we also gave it a very different look to what we are used to. It all started when my husband and I went to Lowe's to pick up some screws and saw these pretty green ornaments. I also used mesh ribbon to decorate the tree and some white ornaments from Dollar Tree and Walmart. and the tree was finished. And the family room feels so warm and festive with the Christmas lights on in the evening. Thank you all for your visit. I hope to have enough time to share with you the rest of our holiday decor before Christmas. Your loved ones will be in your heart during Christmas. Be thankful for the loved ones you are blessed to be with. Maria, your home looks lovely!! You are SO far ahead of me with your Christmas preparations! Thank you for vising my blog today! I enjoyed "meeting" you!! Merry Christmas to you and yours! Your home and decorations are beautiful. I am sorry you wont be with your family in Spain nor your son here and I admire you for 'trying' to be cheerful. It is a hard year for me and I just cant get into the festivities. Thank you for visiting my blog and come back any time. Maria: Simply gorgeous!!! Your tree and mantel are just breath-taking!!! I also feel the holiday is coming way too fast for my liking. I am sorry to hear you are decorating with a "heavy heart". I understand the feeling of missing family. My parents and my brother and his family moved to Florida 2 years ago. The holiday tho enjoyable is just different. Maybe a little of the "magic" is missing. And of course the holidays seem to amplify those feelings. I wish you and your family many blessing. ThE tree, actually the entire room - BEAUTIFUL! I am just the opposite of you. For the first time ever, I am all decorated and ready for Christmas early. I am just relaxing and enjoying each day. This will be a very different Christmas for our family. Tomorrow night we take our daughter to the airport for a vacation in Kauai with her boyfriend's family. We have never had a Christmas without our daughter. Our son is newly engaged and will be with his future in-laws on Christmas Eve. They just live a few blocks away and we could certainly drop in on Christmas Eve, but we want to give them dedicated time with her family. JP and Aylin will come to us for breakfast and we get them the rest of the day. Steve and I made reservations at a French restaurant that is all decorated for a Joyeux Noel on Christmas Eve and then we will just have a quiet evening with each other. We have never had that in 45 Christmas Eve's we have spent together. Simply beautiful! Love your tree and fireplace! Thanks for stopping by today! Beautiful as always. I loved your mantel and your tree looks fabulous. I am drawn to your green. Beautiful display. I am so sorry you are feeling homesick Maria Elena. I know how important family is and being away from them must be very difficult. Your living room looks absolutely beautiful. That particular hue of green is my favorite to decorate my home with and my Christmas tree too. Love, love, love it. I do pray that all the beauty around you cheers your heart up a bit. Sending you a warm hug. Such a fun twist to make lime green the predominant color...I love it! I am so behind this year...Your home is so beautiful! The tree is gorgeous. I love it beside the fireplace. The greens and whites are pretty together. What would we do without dollar tree?? I do love the colors you chose this year! The tree is very pretty and I bet you are happy each time you look at it! My heart really aches for you, Maria...you are so far from your true home! I hope you get to visit this coming year, and soon! And I pray your son gets to visit soon as well. Is your husband from Spain, too? Your tree is stunning! You took a chance and it's a winner as always. And your hearth is simply beautiful! What a creative talent you are! Sending warm (maybe cool?!!) wishes to you! Awww, I feel for you Maria Elena, they will be missing you too♥ I love your green ornaments and your tree is beautiful! Your green and white is so fresh. I see why you came home with bags of decorations! :) These look so good against your white stone fireplace. Enjoy the holidays even though not everyone will be there. I have been following your decorating since the "Kirkland" days. Your tree is beautiful! In fact your home is impeccabley decorated holiday or not. I know how you feel about missing family and the Texas heat. Wearing Capri's on Christmas, just does not shout HO HO HO. Enjoy your Christmas and have a healthy, happy New Year. Hi, Dee! It is wonderful to hear from you! Thank you so much for your wonderful comment, Merry Christmas! Your tree and mantle lit up are stunning! I hope the lonely bug goes away soon and you enjoy the holidays. So pretty, Maria Elena! 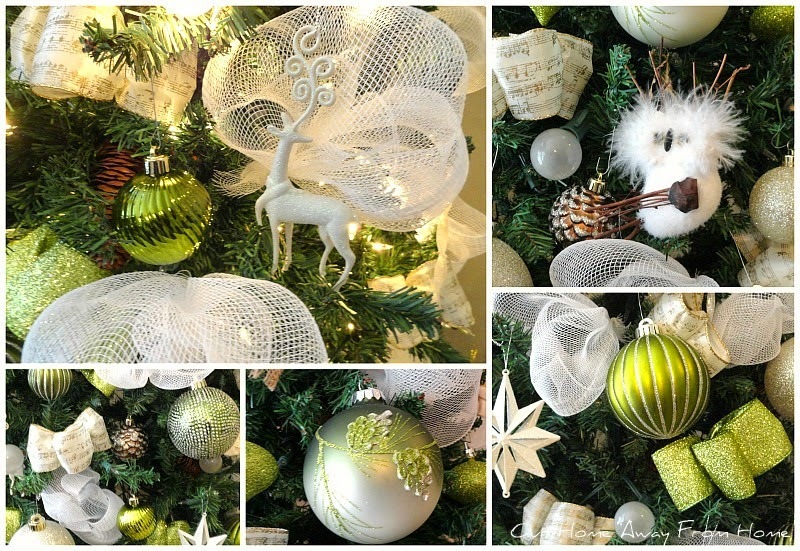 I love the different shades of green with the creamy white/gold ornaments. Your mantel and tree complement each other perfectly! Love your gorgeous tree! The green color really shines! Thank you so much for sharing it with us at Ivy and Elephants. You are featured this week! Please feel free to drop by and grab a featured button. Wishing you a happy and blessed holiday season.